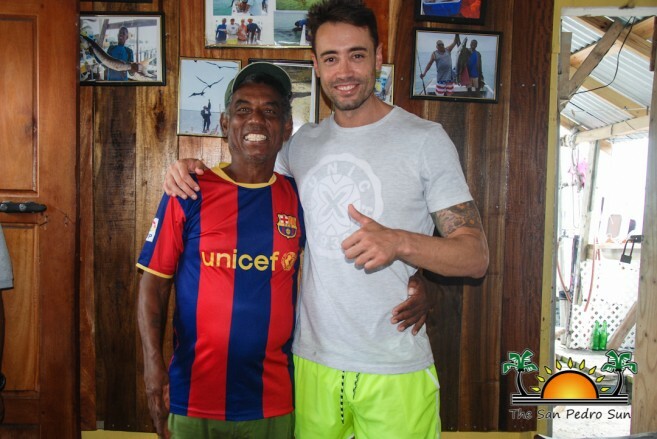 Football fans in San Pedro Town were delighted to meet world renowned Spanish Futsal Player and goalkeeper for the popular Football Club Barcelona, Francisco ‘Paco’ Sedano on Wednesday, July 5th. Paco was in Belize from Sunday, July 2nd under the auspices of EFHRE International University. During his stay in the Jewel he made donations to the National Sports Council and met with government officials in regards to future projects in Northern Belize and Ambergris Caye. Sedano had been to Belize before but never to San Pedro Town, so on Wednesday he made a short visit to La Isla Bonita. Despite the gloomy weather, he was still able to explore the Belizean Barrier Reef off the coast of town. Sedano shared with The San Pedro Sun that he had a great time on the island and that local tour guide Pany Arceo gave him and his team a spectacular tour at the Hol Chan Marine Reserve. He added that his visit to the country was more of a business trip, as he and representatives from EFHRE International University are in the process of establishing a campus in Belize. He also said there were other large projects in the plans, including a medical facility in San Pedro Town. “We are hoping to build a properly equipped health center to service all island residents. It will also count with rapid emergency services and air transfers for further treatments on the mainland,” said Sedano. He looks forward to the support of the local authorities and the respective government officials in getting started. The footballer also mentioned that there will be another project in the Orange Walk District, in Northern Belize. “We have been in meetings with government officials regarding the construction of the university campus, a health centre, business centre, an area for sporting activities and a residential zone as well,” said Paco. Land has already been acquired in Orange Walk and Paco hopes that they can soon start executing the project. After his quick visit to San Pedro, Paco and his delegation headed to Belize City where they made a donation of sporting gear to the National Sports Council at a brief ceremony held at the Marion Jones Sporting Complex. The representatives of the delegation also offered assistance to the National Sports Council, both technical and equipment wise, in multiple areas and in all sporting disciplines. The footballer and his delegation depart on Thursday, July 6th, hoping to return to the country soon. In his next visit to the Jewel, Sedano is looking forward to have an extended stay in San Pedro Town so he can see more of the island and interact with the island residents.